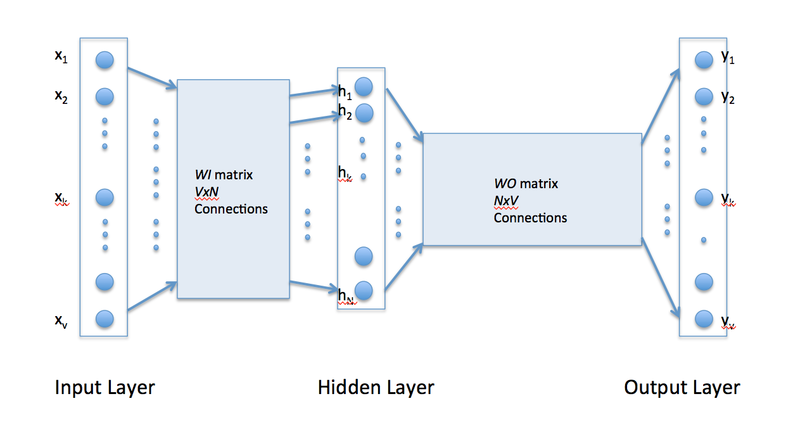 Word embeddings are not unique to neural networks; they are common to all word-level neural language models. Embeddings are stored in a simple lookup table (or hash table), that given a word, returns the embedding (which is an array of numbers). Figure 1 (check in ref link) shows an example. A Recurrent neural network has the capability to give itself feedback from past experiences. Apart from all the neurons in the network, it maintains a hidden state that changes as it sees different inputs. This hidden state is analogous to short-term memory. It remembers past experiences and bases its current answer on both the current input as well as past experiences. An illustration is shown in Figure 4(check in ref link ). Here ek∈ℝ|D| is a binary vector which is zero in all positions except at k-th index. The Lookup Table layer can be seen as a simple projection layer where the character embedding for each context character is achieved by table lookup operation according to their indices. The embedding matrix M is initialized with small random numbers and trained by back-propagation. We will analyze in more detail about the effect of character embeddings in Section 4.
where W2∈ℝ|T|×H2, b2∈ℝ|T|×1. f(t|c[i-2:i+2])∈ℝ|T| is the score vector for each possible tag. In Chinese word segmentation, the most prevalent tag set T is BMES tag set, which uses 4 tags to carry word boundary information. It uses B, M, E and S to denote the Beginning, the Middle, the End of a word and a Single character forming a word respectively. We use this tag set in our method. The model is then trained in MLE-style which maximizes the log-likelihood of the tagged data. Obviously, it is a local model which cannot capture the dependency between tags and does not support to infer the tag sequence globally. where fθ(ti|c[i-2:i+2]) indicates the score output for tag ti at the i-th character by the network with parameters θ=(M,A,W1,b1,W2,b2). Given the sentence-level score, Zheng et al. proposed a perceptron-style training algorithm inspired by the work of Collins  . Compared with Mansur et al. , their model is a global one where the training and inference is performed at sentence-level. Workable as these methods seem, one of the limitations of them is that the tag-tag interaction and the neural network are modeled seperately. The simple tag-tag transition neglects the impact of context characters and thus limits the ability to capture flexible interactions between tags and context characters. Moreover, the simple non-linear transformation in equation (2) is also poor to model the complex interactional effects in Chinese word segmentation. We find that the learned word representations in fact capture meaningful syntactic and semantic regularities in a very simple way. Specifically, the regularities are observed as constant vector offsets between pairs of words sharing a particular relationship. For example, if we denote the vector for word i as xi, and focus on the singular/plural relation, we observe that xapple – xapples ≈ xcar– xcars, xfamily – xfamilies ≈ xcar – xcars, and so on. Perhaps more surprisingly, we find that this is also the case for a variety of semantic relations, as measured by the SemEval 2012 task of measuring relation similarity. The vectors are very good at answering analogy questions of the form a is to b as cis to ?. For example, man is to woman as uncle is to ? (aunt) using a simple vector offset method based on cosine distance. --[[ Example of "coupled" separate encoder and decoder networks, e.g. Returns a new Tensor which is a narrowed version of the current one: the dimension dim is narrowed from index to index+size-1. > print(x) -- memory in x has been modified! This package provide simple object-oriented capabilities to Lua. Each class is defined with a metatable, which contains methods. Inheritance is achieved by setting metatables over metatables. An efficient type checking is provided. Note that class does not clutter the global namespace. Class metatables are then created with class(name) or equivalently class.new(name). You then have to fill-up the returned metatable with methods. Creates a new Torch class called name. If parentName is provided, the class will inherit parentName methods. A class is a table which has a particular metatable. If module is not provided and if name is of the form package.className then the class className will be added to the specified package. In that case, package has to be a valid (and already loaded) package. If name does not contain any ., then the class will be defined in the global environment. If module is provided table, the class will be defined in this table at keyclassName. One [or two] (meta)tables are returned. These tables contain all the method provided by the class [and its parent class if it has been provided]. After a call to torch.class() you have to fill-up properly the metatable. After the class definition is complete, constructing a new class name will be achieved by a call to name(). This call will first call the method lua__init() if it exists, passing all arguments of name(). --- creates a class "Foo"
Another net that uses container modules (like ParallelTable) that output a table of outputs.